Whee, so excited, so i'm sharing my excitement by posting Tours Mai Hime Volume 3 Doujinshi Side Story 2, are you excited?! lol. I'll probably post up the concert pics i take tonight tomorrow ba, cos by the time i reach home, it'll be probably midnight or something lol. It's a THREE hour concert ... 7 PM - 10 PM and no doubt there'll be a wave of people there XD. Ok, I'm gonna eat something before i leave. Cya. PS: Jumping up and down with gee! 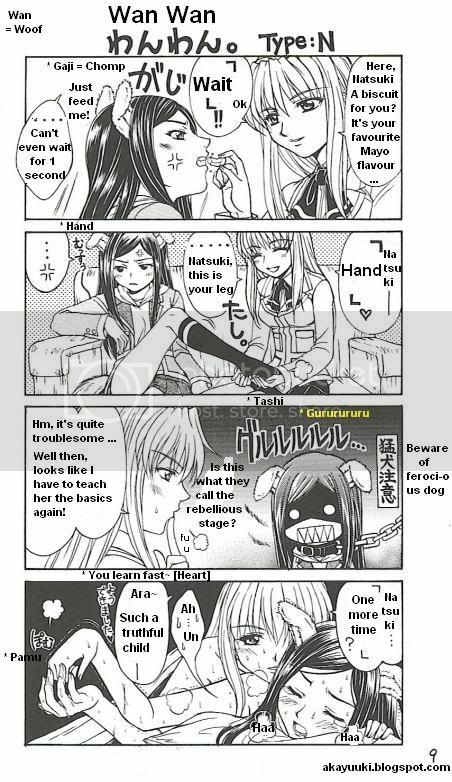 Sure, ok basically, in this sidestory, Natsuki is Shizuru's pet doggy XD and like all dogs, they have to be trained, so Shizuru was like a biscuit for you, and you have to 'Wait' for me to say 'Eat' then you may eat but Natsuki didn't care. Next, Shizuru told Natsuki to show her 'Hand', Natsuki disobeyed Shizuru and showed Shizuru her leg. Then Shizuru probably go annoyed and said that Natsuki need to be 'Retrained' again so that she'll learn. So in the last box, probably it's Shizuru's way of 'Training' Natsuki XD. Oh, I like this one even better than the first side story! ^^ I just love Natsuki! And she's so cute in this one! XD But it's even better when Shizuru has her in hand, lol!